Hawaiian flavors are spreading from the islands to the San Francisco Bay Area with rappers I.A. 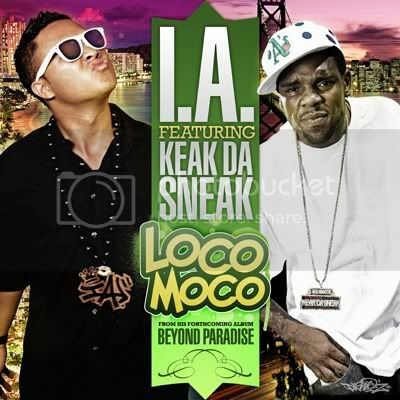 “The Kama’aina Classic” x Keak Da Sneak in their track “Loco Moco.” The video features Osna, Kutmaster Spaz, DJ E-Tech, Caniva, Dos, Krystilez, Image, Big Fish, Tracy Acio, Fiah Brand, R-Klass, DJ Jrama, Tony Black, Flip’t Out Eats, Jesse DeRamos, and Limited Addiction. Hawaiian hip hop pouring on that extra gravy and getting hyphy. The single is off I.A.’s “Beyond Paradise” album. You can download the song FREE here or support him by getting it on . This entry was posted in music on April 27, 2011 by Kevin Hsieh - channel APA.